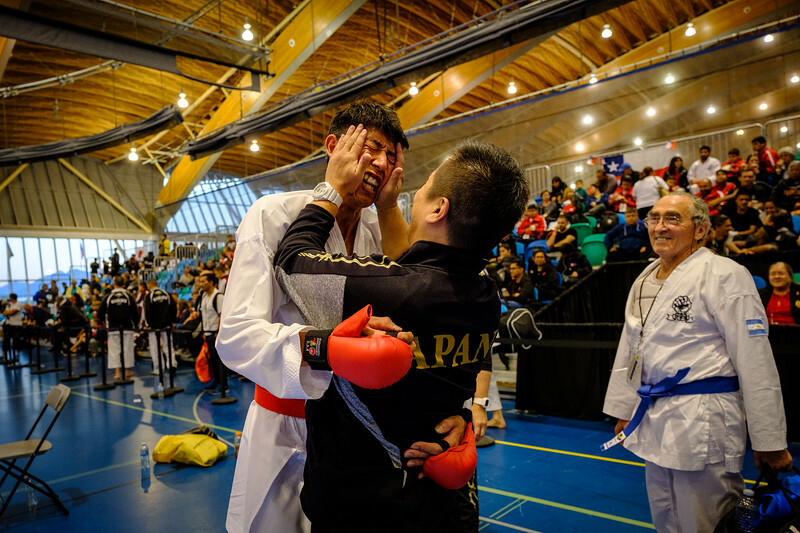 I was covering the 7th International Karate-do Goju-kai Association Global Championships on my own, but as always, everything we did there was a team effort, involving every staff and volunteers on site, as well. 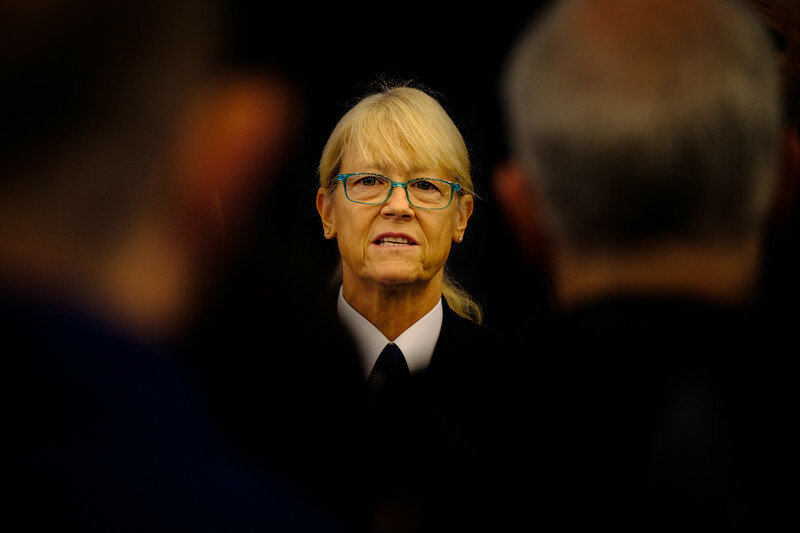 Lyn Rafferty, the event media manager, kept things running. 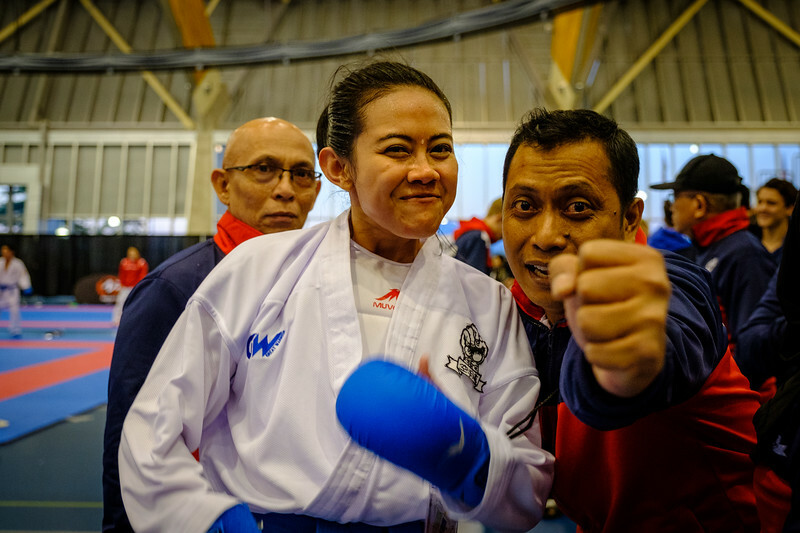 She pushes out all live photos and updates on social media. 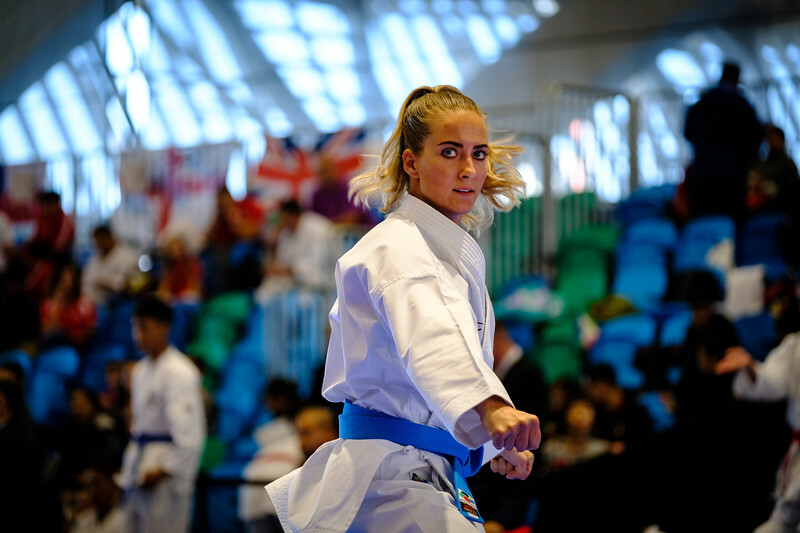 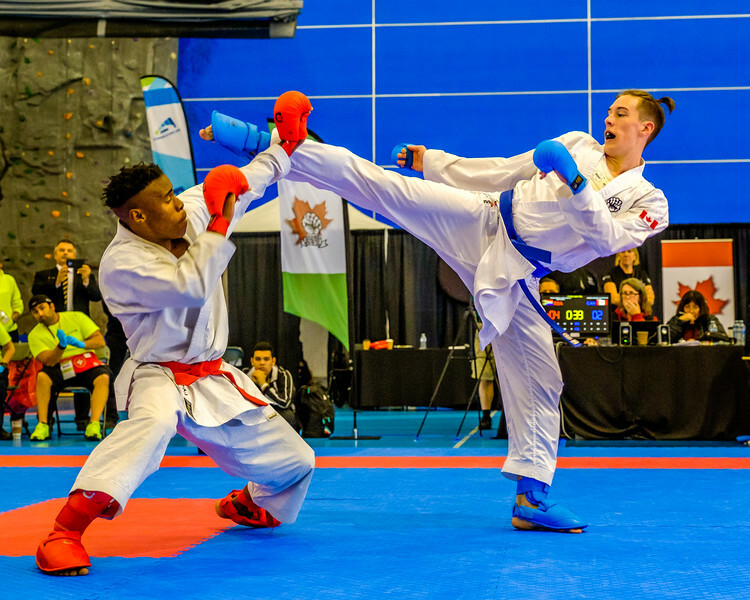 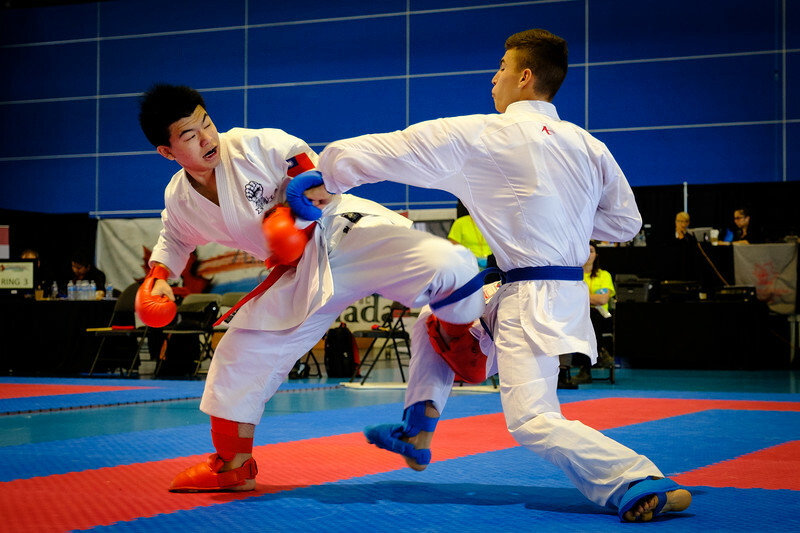 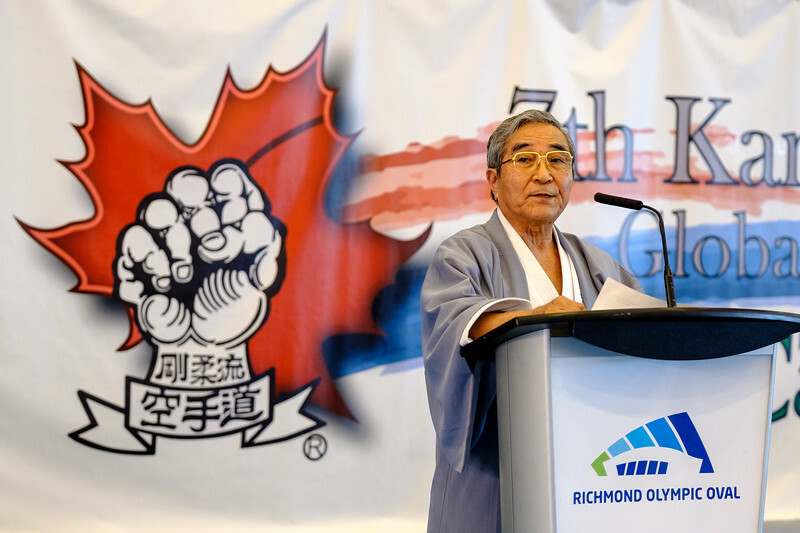 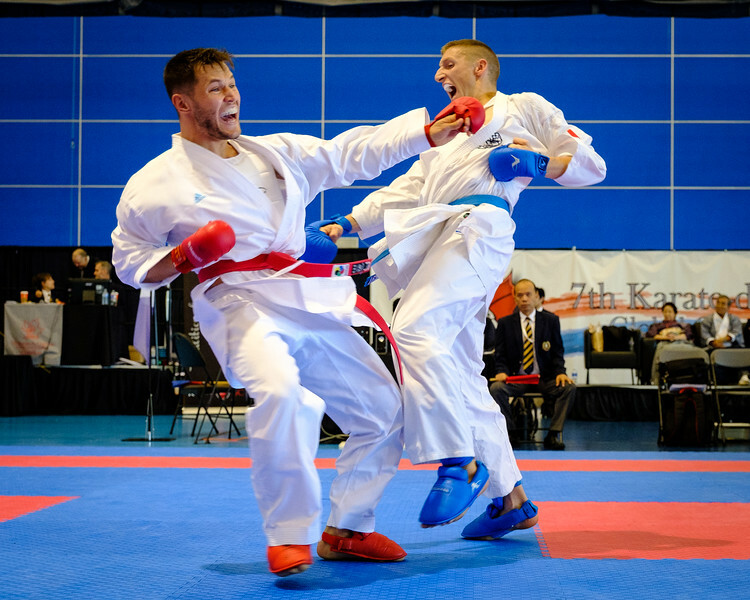 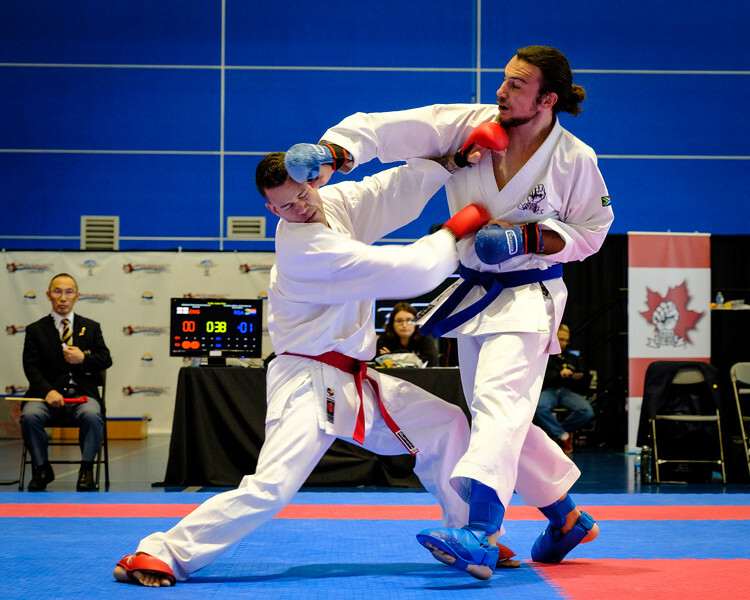 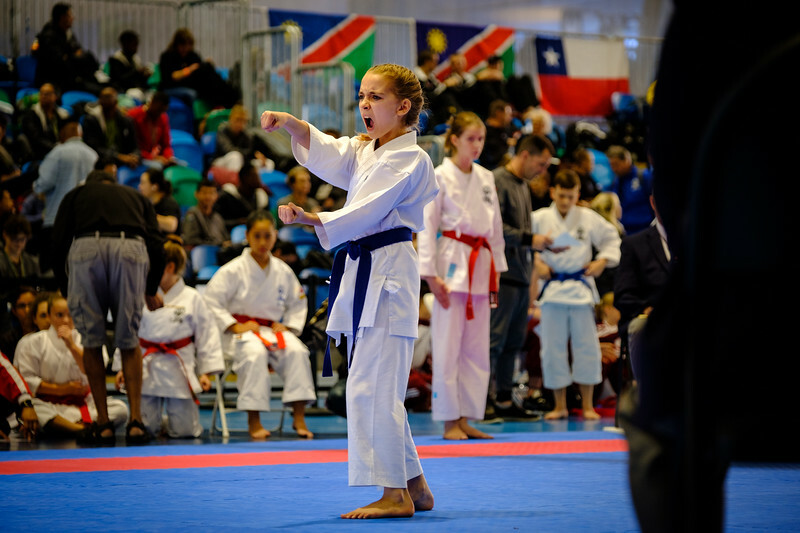 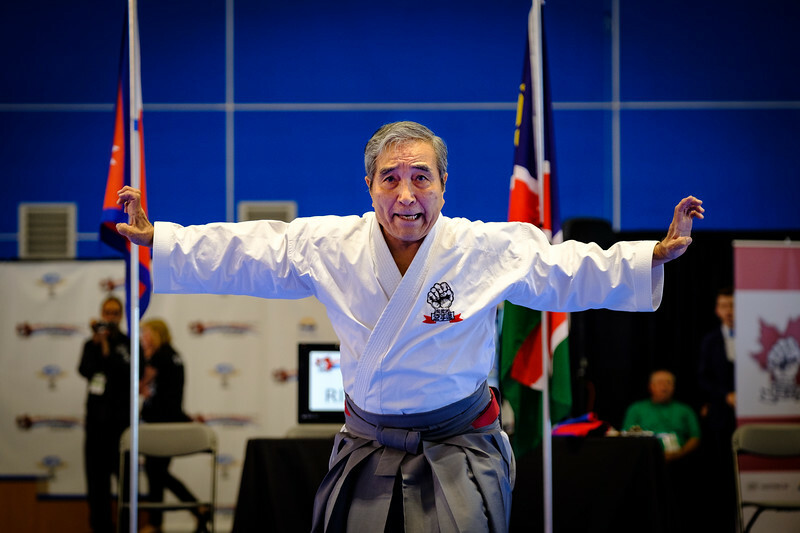 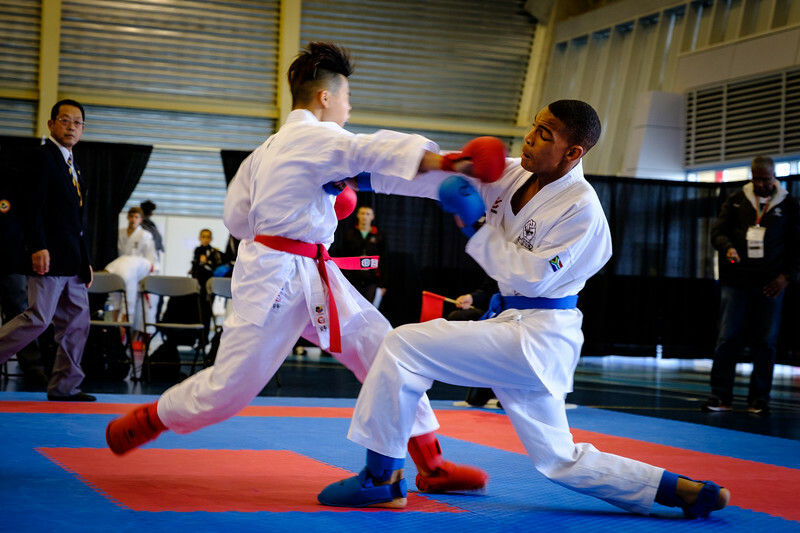 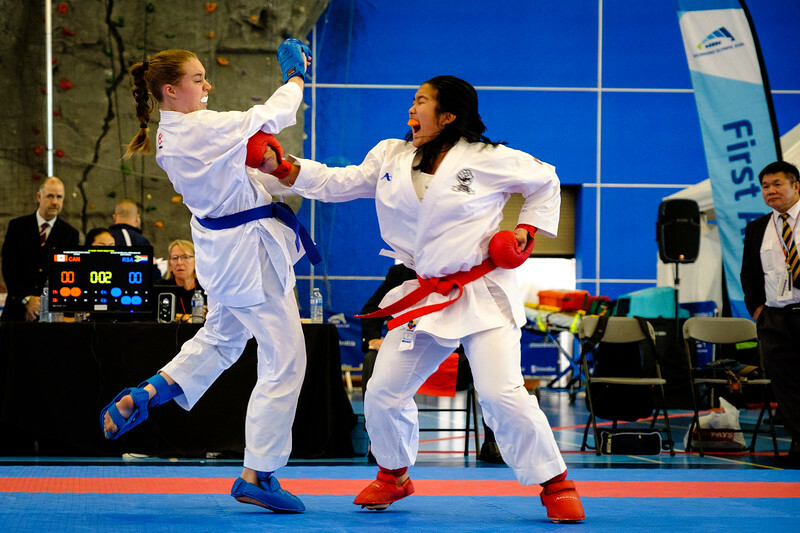 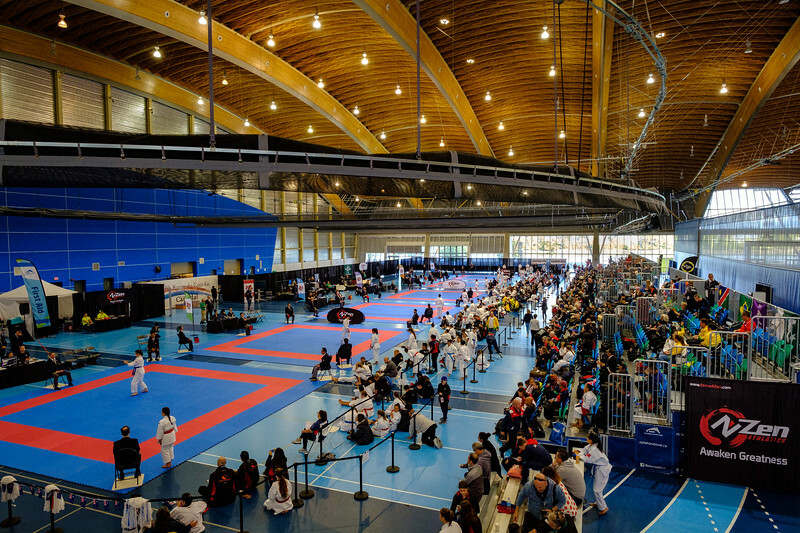 Over the four-day event at the Richmond Olympic Oval, British Columbia over 700 athletes from more than 20 countries, compete on six rings in individual and/or team events, in both kata (prearranged forms) and kumite (sparring). 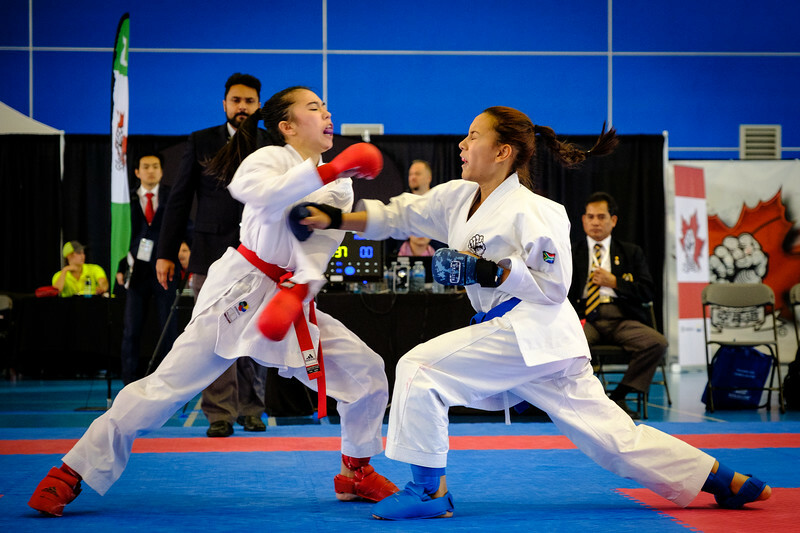 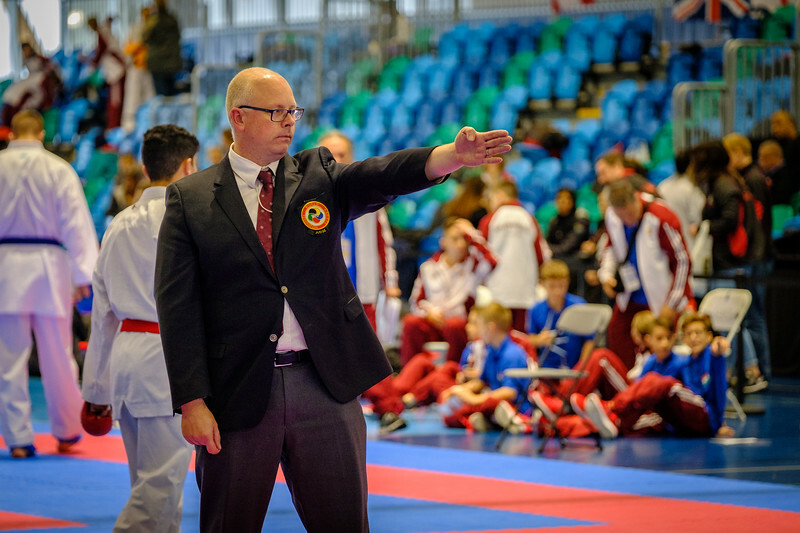 Team Canada consists of the Canada’s top Gojukai karate athletes who are promising medal recipients for the impending 2020 Olympics in Tokyo, Japan. 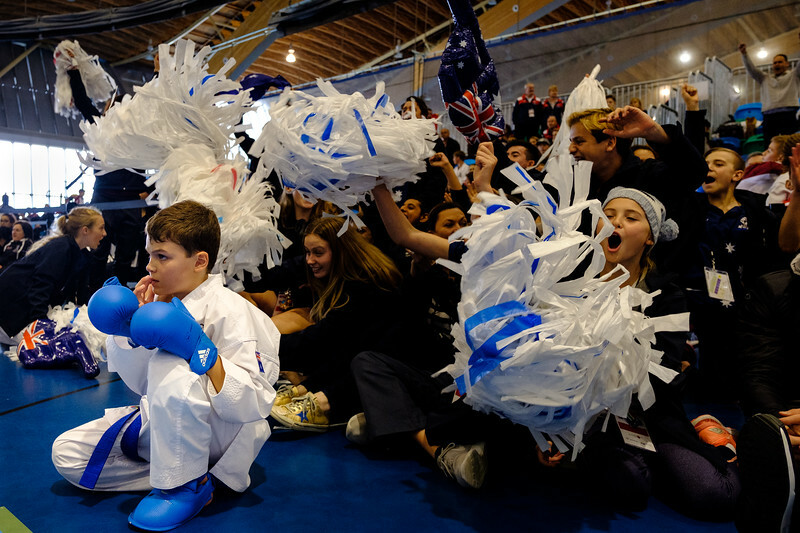 Every night, I would cull my takes as quickly as I could, given the fact of it generally being past midnight. 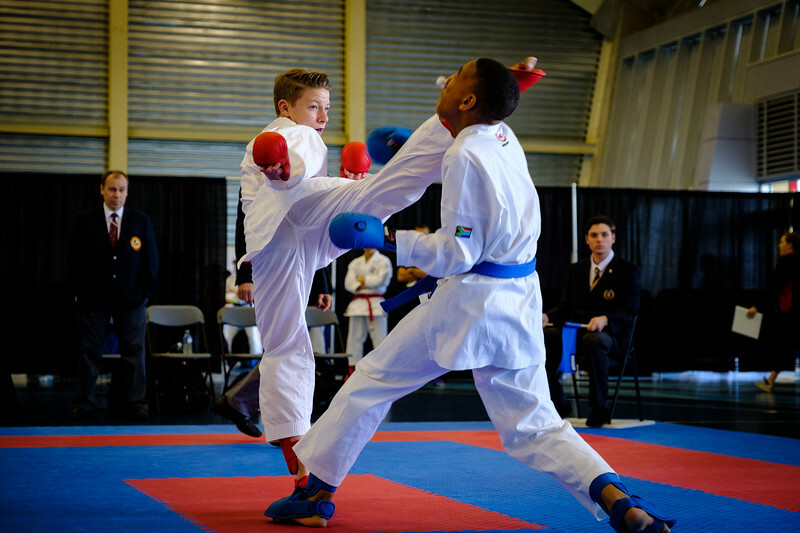 Using Photo Mechanic, I would tag and colour code the best of the day. 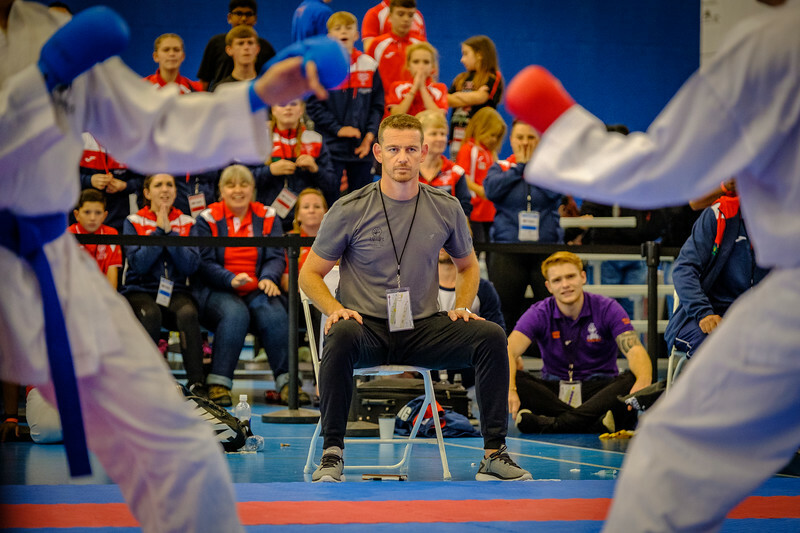 The SOOC files of these photos I would then import them into Lightroom for quick edit, tone, size and colour correct those files and drop them back into SmugMug in a folder designated for web use and social media. 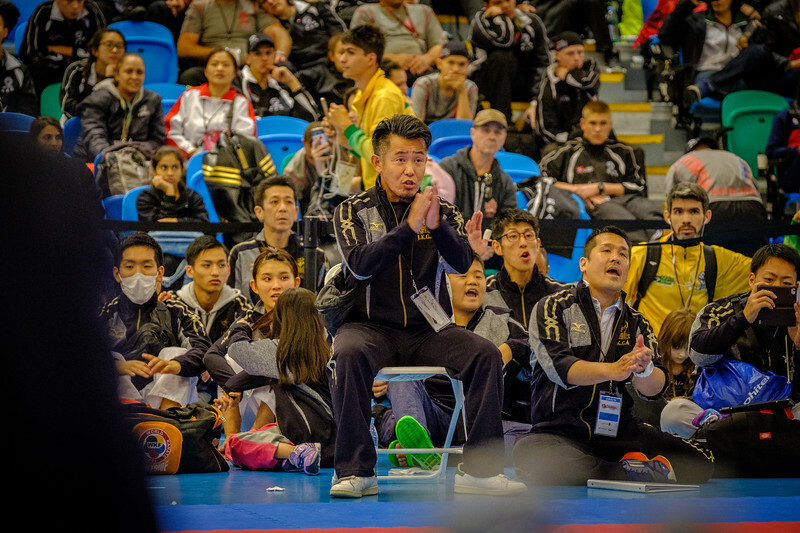 Couple hours later, my morning coverage starts, and by the time the venue would break, usually around noon, I could start my typical workflow with Photo Mechanic to pull those files and in between matches, so Lyn, media manager, could post to Instagram, Facebook, or Twitter. 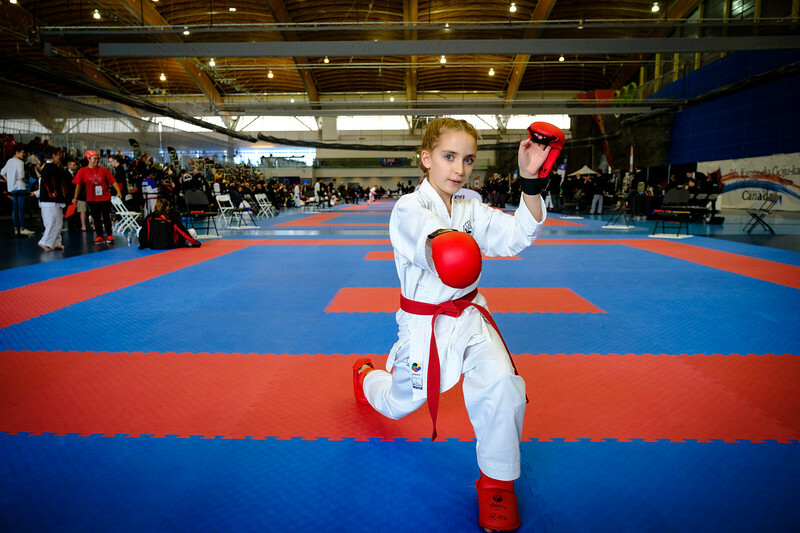 My day started with gear prep about 7am, and usually ended around 6pm. 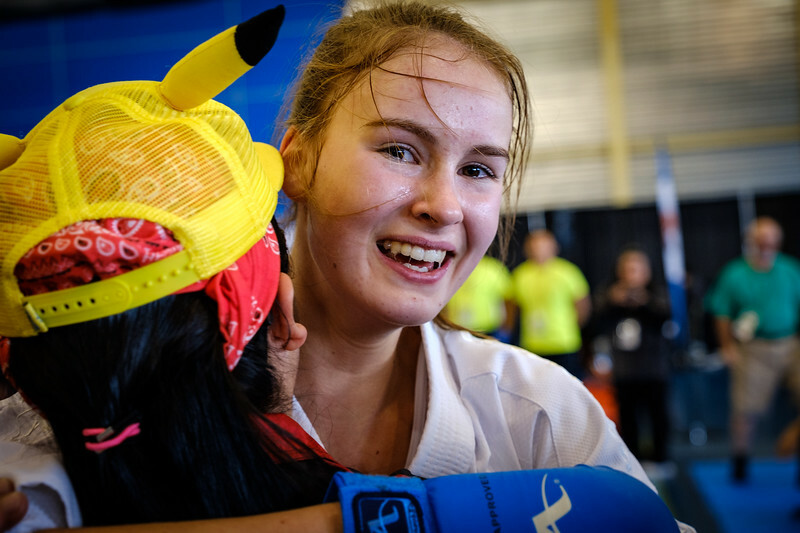 Amelia Cooper (CAD) hugs her teammate after she won the 14/15 Female - Cadets Kumite +54kg final. 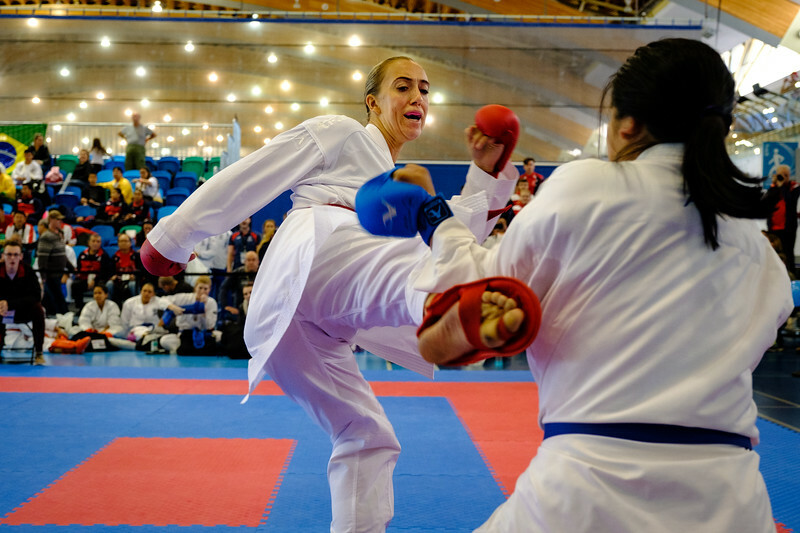 During the Games, I shot with two X-T2s with XF16-55mm and XF50-140mm lenses and a XF14mm at various times. 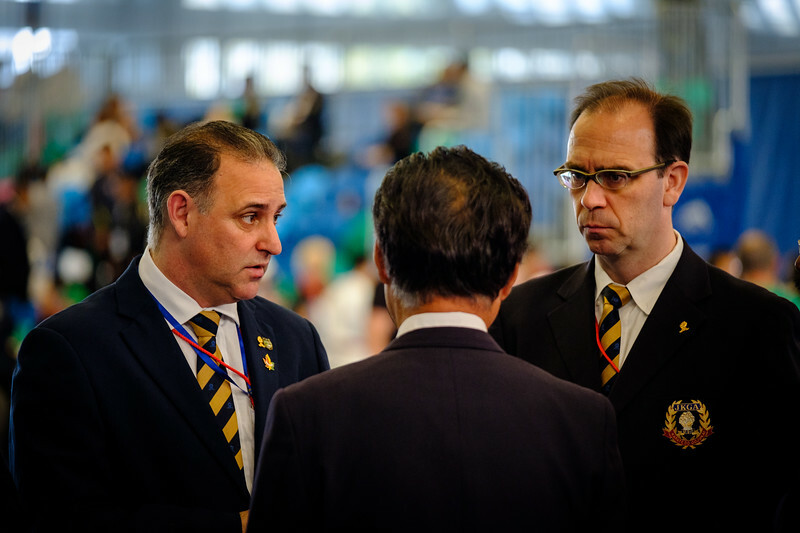 It was an exhausting effort, on everybody’s part, as I guess it should be, trying to keep up with the matches. 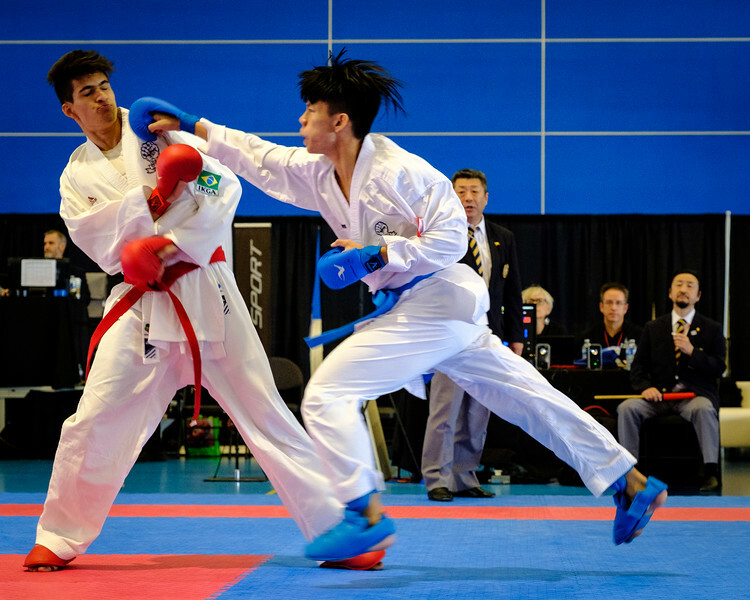 The athletes performed magnificently, and deserved the best photographic efforts. 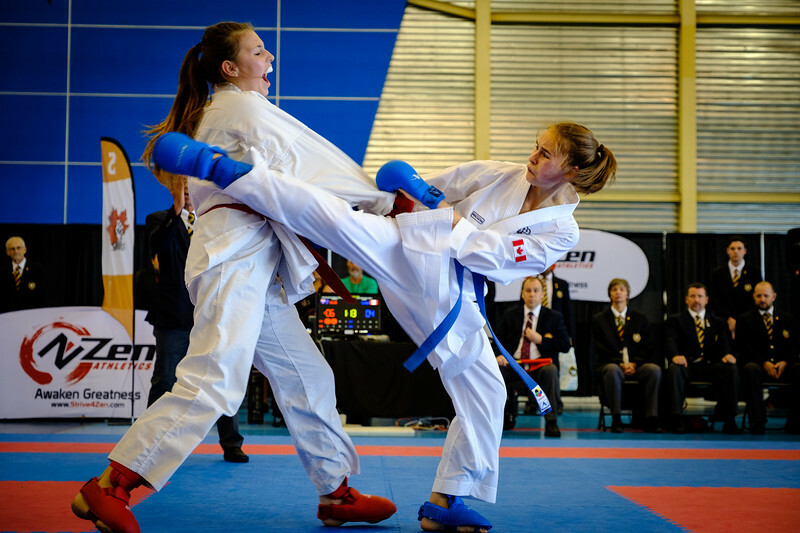 It was a privilege to see the performances, as it was to be amongst the photographic talents assembled in Richmond. 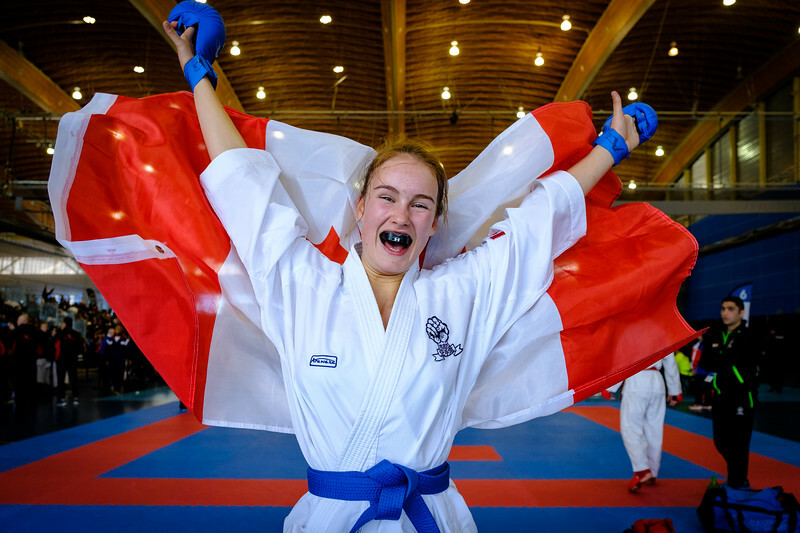 Just a terrific collection of hard working, dedicated pros. 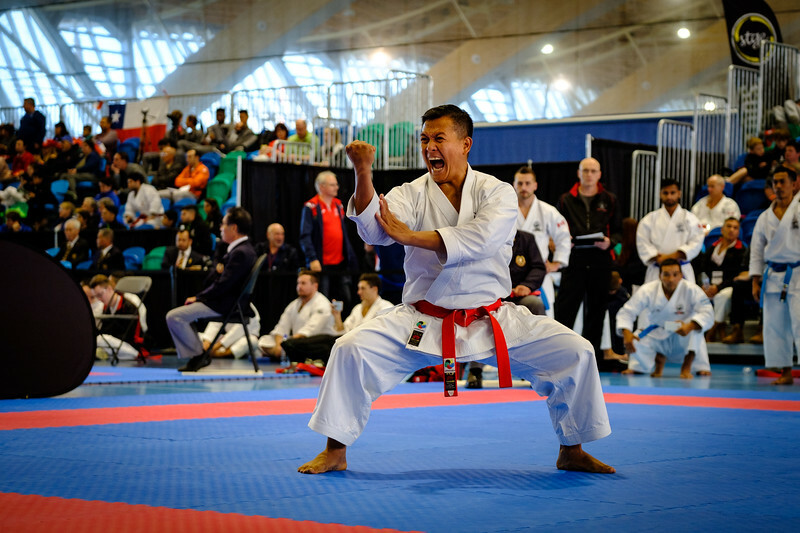 Learned a lot, just watching the variety of approaches to Karate, many of which I had not shot in forever. 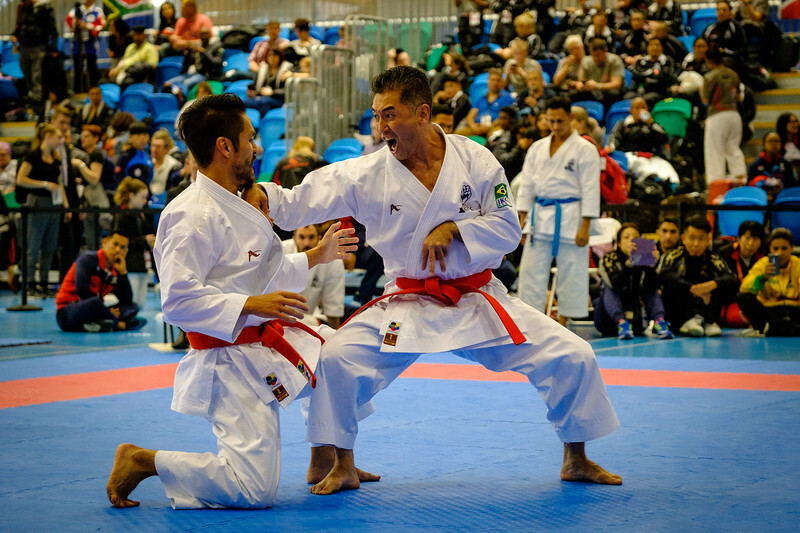 Tokyo here we come!